As a proven leader in the lawn care industry, Seamans Lawn & Landscape Inc. is a reliable name you can trust. We have the knowledge and experience that one can only expect from the best. 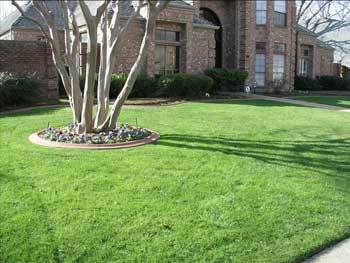 Our goal is to provide the highest quality lawn and plant care services money can buy. We offer expert services to help manage the health and vigor of both lawns and ornamental plants. Our programs consist of seasonally scheduled visits that are specifically designed to ensure the ideal appearances and beauty of any landscape. The staff at Seamans are trained to recognize, diagnose, and treat a variety of diseases, insects and weed problems. We recommend proper maintenance and watering practices to help derive the most benefit from our scheduled lawn and plant care applications. We are licensed by the Structural Pest Control of the State of Texas. All products used by Seamans Lawn & Landscape Inc. are registered by the EPA. We use only the best products and stand behind our work 100%.